Does CodeHS have any tools that help teachers prevent/detect cheating? CodeHS Pro has several tools that help you proactively prevent student cheating. You can access these tools directly from: https://codehs.com/teacher/cheat_detection. You can also access all of these tools from the expanded version of the CodeHS Toolbox. First, open up the Full Toolbox. Then, you can find Cheat Detection underneath Code Review. First and foremost, we highly encourage your students to sign the CodeHS Honor Code. This will help set the tone for the rest of the year around what is acceptable and what is not. Teachers now can shuffle quiz questions and prevent copy/paste to prevent student dishonesty. Both of these settings are Pro features. You can find these cheat prevention tools from “Section Settings,” which you can access from clicking on the gear button in the upper right corner of your section page. Note: You will need to enable Shuffling Quiz Questions and Copy/Past Prevention by visiting “Section Settings.” These features are not part of the default settings. You would also need to do this for each section that you teach on CodeHS. Code History: The Code History tab is a way for teachers and students to see all of the changes and revisions that have been made to a certain program. It is accessible on any exercise page under the "More" tab in the top right corner. The History tab is a great tool to aid in cheat detection, as teachers can assume that exercises (particularly more complex exercises) that are solved in very few code runs/saves are often attributable to borrowed or copied code. The History tab is available on all students pages regardless of whether their class is using the free or pro version. Code Timeline: This tool shows you the amount of time each student spent on an exercise, and when they worked on it. Time Tracking: This tool provides a different view, showing how long students spent on a given exercise, and how many tries or code runs it took them to complete it. You can find the Time Tracking tool under the "More" tab by visiting "Labs" at the bottom of the dropdown menu. 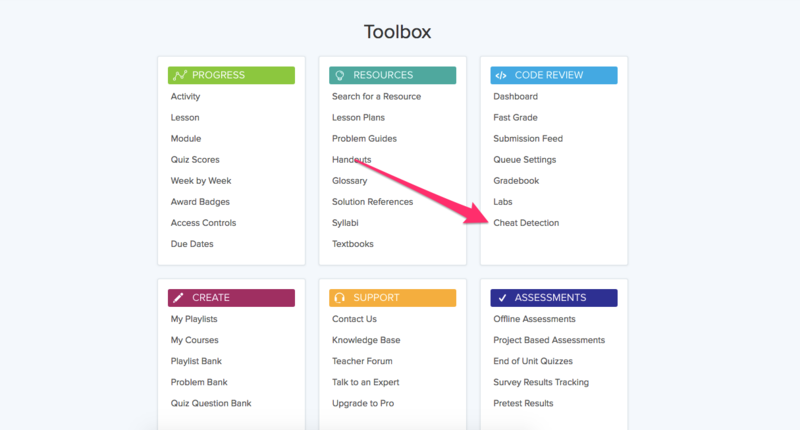 Code Search: This is a beta tool that allows you to search for a section of code, and see every student program that contains that piece of code. You can get to this tool through the "Labs" page, which can be found under the "More" tab of your class page. In Code Search, you can search for a code snippet across all of your students' programs. 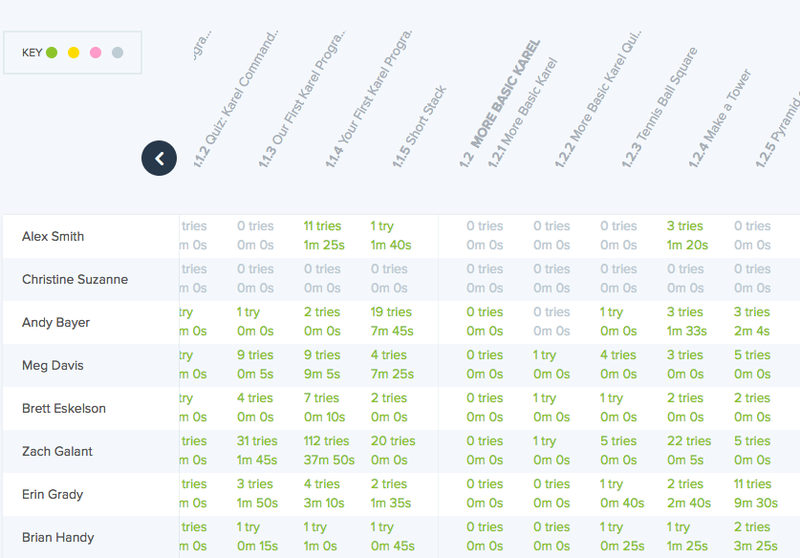 Code Search, Time Tracking, Code Timeline are all Pro features. If you have questions and are on the Pro plan, call or email your Account Manager. If you have other questions about these tools email hello@codehs.com.